Monopod, Tripod, Handle, Suction Cup There are 27 products. Telescopic monopod 135cm (extended) stainless. Gopro tripod included. 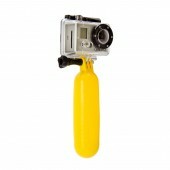 Yellow floating grip handle is a great way to steady your videos.Floats camera + LCD BacPac and camera + 3D Hero System. Delivered with a wrist loop and a screw. Blue floating grip handle is a great way to steady your videos.Floats camera + LCD BacPac and camera + 3D Hero System. Delivered with a wrist loop and a screw. Green floating grip handle is a great way to steady your videos.Floats camera + LCD BacPac and camera + 3D Hero System. Delivered with a wrist loop and a screw. White floating grip handle is a great way to steady your videos.Floats camera + LCD BacPac and camera + 3D Hero System. Delivered with a wrist loop and a screw. Pink floating grip handle is a great way to steady your videos.Floats camera + LCD BacPac and camera + 3D Hero System. Delivered with a wrist loop and a screw. Go-Pole "The Bobber" handle is a great way to steady your videos.Floats camera + LCD BacPac and camera + 3D Hero System. Available in yellow only and delivered with a wrist loop. 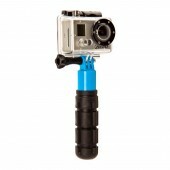 Light and compact black/blue handle for GoPro camera. Very grippy, small, durable, light and convenient ! Handle for camera stabilization with 1/4" standard screw.GoPro adapter included. Intova Pod can twist around a branch, railing, beam or many other support options. Compact black handheld mount pole for camera with GoPro adapter Very grippy, small, durable, and convenient ! 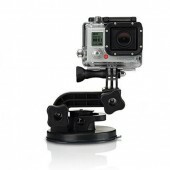 Suction cup with standard screw 1/4" for compatible cameras provided with tripod adapter for GoPro cameras. A 10-inch flexible camera stand that will allow you to mount your camera in a multitude of places; bikes, stair rails, roll cages, and almost anything you can think of. Black floating grip handle is a great way to steady your videos.Floats camera + LCD BacPac and camera + 3D Hero System. Delivered with a wrist loop and a screw.